Painting & Stains, Natural Finishes & Preservatives, Deck Washing, Mildew Control, Wood Shingle Roof Treatments, Historical Restorations & Custom Colors, Carpentry, Shutters, HEPA Vaccum Sanding. 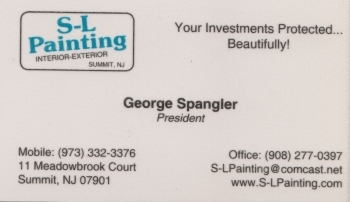 Painting & Decorating, Wallpaper & Wallcoverings, Plaster & Sheetrock Repairs, Custom Staining, Carpentry & Repairs, Corporate, Commercial, Water Damage Repair. Everyone in the family was very happy at the way this work turned out, and it was done promptly - Thank You very much.